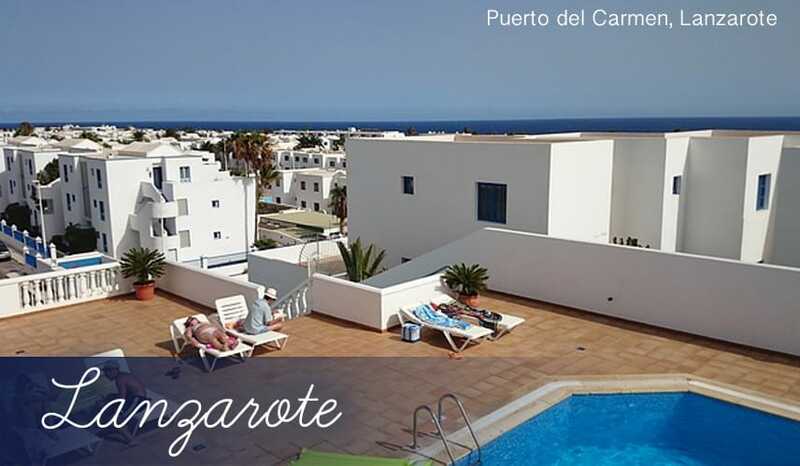 Popular tourist resort: Puerto del Carmen holidays are the most popular in Lanzarote. What makes it a real attraction for so many holidaymakers is the great selection of restaurants, bars and shops. Plus, with so many of us Brits having holidays in Puerto del Carmen every year, you can rest assured you’ll find all your home comforts here. Two sandy beaches: Holidays to Puerto del Carmen are often based around the beach, and with good reason too. Playa Grande, the main beach in the resort, is a large slice of sandy paradise. With a wide expanse of soft golden sands decked with huge palm trees, it’s a lovely place to relax. Whereas Playa Chica (or Fariones, named after the hotel) enjoys a central spot in Puerto del Carmen but has a much smaller stretch of coastline. If you have not yet read our holiday guide for Lanzarote, click "Lanzarote Holidays" where you'll find many more resort guides. Holidays to Costa Adeje for example is one of Lanzarote's top holiday resorts for UK holidaymakers. Gran Casino de Lanzarote: This impressive casino is a great way to spend an evening during holidays to Puerto del Carmen. All the games you’d expect are here, including roulette, blackjack and poker. You could also enjoy a slap-up luxury meal and treat yourself to a few glasses of champagne while you’re there! Windsurfing holidays: Water sports are a big feature of many holidays in Lanzarote due to the strong winds further out to sea. This is no exception at Puerto del Carmen, where Playa Grande attracts many budding windsurfers of all levels. Diving holidays: With a rich array of aquatic life including all kinds of colourful fish, turtles, rays and yes, even sharks, it’s no wonder holidays to Puerto del Carmen are a haven for divers. The PADI diving school, Manta Dive Centre is the place to head if you’d like to explore the deep blue sea of Puerto del Carmen. Beginners are just as welcome as experienced divers too. Canarian Whale and Dolphin Museum: Here’s an interesting little museum. In Puerto Calero, just a few miles west of Puerto del Carmen you’ll find this fascinating exhibition about the whales and dolphins which live in the seas around Lanzarote. There are over 30 species of these beautiful marine animals to be found on holidays in the Canary Islands, and this museum provides visitors with lots of interesting information about their habitat, communication and breeding. Playa Grande: The main beach in the resort, and a major reason why many tourists come back for holidays to Puerto del Carmen year after year. It’s a gloriously golden 3km-long beach which leads to the clear, fresh waters of the Atlantic Ocean. The palm tree lined coastline here is well supported with sun beds, parasols and pedalos. Plus, you’ll find a great choice of bars and restaurants along the beachfront. Playa Chica: At only 90m long, this beach is much smaller than the lengthy Playa Grande. But hey, the bonus is it’s much quieter too! Also known as Fariones beach, (due to Los Fariones Hotel being nearby) this is a popular place for windsurfing and diving holidays. Emma’s Cantina Mexicana: If you’ve got any sort of love for Mexican cuisine then this restaurant is unmissable on holidays to Puerto del Carmen. You can expect to sample many classic Latin American flavours here, including Nachos with Guacamole Dip, sizzling Chicken Fajitas and home-made slow-cooked Chilli. Bellenies: The presentation is of such a high standard at this restaurant the food almost looks too good to eat! There’s a good choice of internationally-inspired dishes, such as tuna lightly fried with soy sauce and spring onion, or baked Brie stacked with crisp breads and sweet apricot and cherry chutney. Beachfront bars: Most of the bars on Puerto del Carmen holidays run along the beachfront, aptly known as ‘The Strip’, it’s Spanish name is Avenida de Las Playas. There are some great bars here mainly aimed at the British on their holidays, such as Arthur’s, Grasshopper and Charlie’s. The clubs here can be pretty lively too, with some playing loud music until the early morning. The nightclub Paradise is one of the best for all night partying. Chilled holidays: If hectic nightlife isn’t really your thing, luckily Puerto del Carmen holidays have a big variety of bars. The old town has a much quieter character, with many places to relax with a few cocktails in a calm atmosphere. There’s a good mix of locals and tourists around here, so you can enjoy your night out in more authentic surroundings. For partying with a Canarian flavour, head to Disco Rumm or Cafe La Ola. Shopping by the beach: As is the case with many holidays in the Canaries, the bars, restaurants and shops all tend to be grouped together conveniently on one road. You’ll see that Puerto del Carmen holidays continue this trend as many of the perfume, alcohol, electrical and clothes shops here are all to be found on the Avenida de Las Playas. It’s the same beachfront road where most of the restaurants and bars are located. Biosfera Shopping Centre: Built in 2002, this part open-air modern shopping centre is quite a contrast to the old town of Puerto del Carmen where it’s based. The centre has a strong focus on fashion, with over 50 shops including international brands such as Zara and Benetton.